Rate information contained on this page may have changed. Please find latest savings rates. 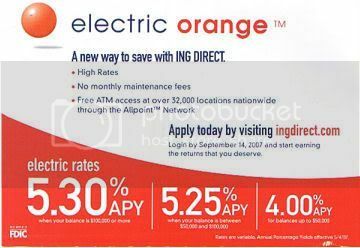 I just received a flyer in the mail advertising ING's Electric Orange account. In speaking with many people, I often hear that the inconvenience of waiting to access the money is one concern since it usually takes 2-3 days to remove funds from an online bank. ING now provides its customers with the ability to withdraw the money via the ATM ($1,000 daily limit) or via a debit card (as much money as in the account). 5.30% APY for balances of %100,000 or more. 5.25% APY for balances between $50,000 and $100,000. 4.00% APY for balances up to $50,000. The 5.30% and 5.25% APYs are competitive although you will have to deposit substantial sums to get it. In addition, ING is the only bank at that rate level, besides Everbank, that offers instant access to the cash via check writing or a debit/check card. This is really a checking account and that's what they call it on the ING site. I called ING to see if there was any limit to the amount of money I could withdraw via my checkcard and the answer if you can debit out as much money as you have in the account. There is a $1,000 daily withdrawal limit using the ATM. If you have a large amount of money to deposit, are looking for competitive rates, and easy access to the money you might want to consider the electric orange account. If you don't want to deposit that much money you might also want to consider ING's classic Orange Savings Account. The rate on this isn't as competitive but its a good, easy-to-use, no minimum balance account from a known entity. ING Direct is backed by ING (NYSE:ING), a global financial institution of Dutch origin offering banking, insurance and asset management to over 60 million private, corporate and institutional clients in more than 50 countries. ING Direct is FDIC insured. Below is a video of the bank's President, Arkadi Kuhlmann, talking about ING DIRECT. Why Do People Stash Money in Low Rate Accounts? Someone, please answer this question! Why do the masses still stash their money in low rate savings accounts from the big banks like BofA, Citibank, and Chase? There is a big difference between their rates and the market leaders. I wanted to kick off my inaugural post by asking a question. Bank of America, Citibank, and all of the other big banks open far more accounts than their higher interest rate online brethren. Why then do these banks have 100X the deposits of the online banks? Why do most people stash their cash in a lower rate account? Especially cash that they aren't going to touch for awhile. I can understand wanting my checking account at BofA, but I'd want my savings and CD money earning the highest rate possible. Let's take a look at the difference. According to the BestCashCow savings rate charts, the highest rate for a $1 minimum deposit account is FNBO at 6%. FNBO is FDIC insured and is actually the online group of the First National Bank of Omaha, which has been around for the last 150 years. Your money is safe there, at least up to $100,000. A quick check on the BofA site shows that their regular savings rate, with a minimum balance of $300 has a whopping rate of .2% APY. Yes, you read that correctly, .2%. That's a full 5.8% below FNBO. Okay, so BofA likes to reward their rich customers with better rates. Let's see what some of those premium savings accounts yield. I looked for a better yielding account but couldn't find one so finally settled on their high end checking account. The rate there was .05% APY. You read that right. Countrywide is the biggest bank on the chart at 5.4% while HSBC is further down at 5.05%. Clearly the big banks don't want our deposit money. Either that or they expect that that we will keep money in low rate accounts either because of convenience or sheer laziness. So, one of the easiest ways you can make some easy money is to get off your duff and take a look at the other rates out there. Every year, Americans collectively lose at least $80 billion in income just by putting their savings in the wrong bank accounts. BestCashCow is the most comprehensive bank rate site on the Internet and our mission is to help you to avoid your share of these losses and to earn and save more. By displaying all of the rates from over 8,000 banks and 7,700 credit unions, we enable you to move your money to more profitable places. You can learn more about the company here. Receive the best bank rates every Monday right to your inbox. Provided by BestCashCow. Should I Open An Online Savings Or Money Market Account? What is the Difference Between a Savings Account and a Money Market Account? How Much of Your Money Should Be in Cash? Does Opening a Savings, CD, or Checking Account Impact on Your Credit Score? How Much Do You Need for Your Retirement? Medical Savings Account or Health Savings Account? This page was created in 0.5868 seconds.